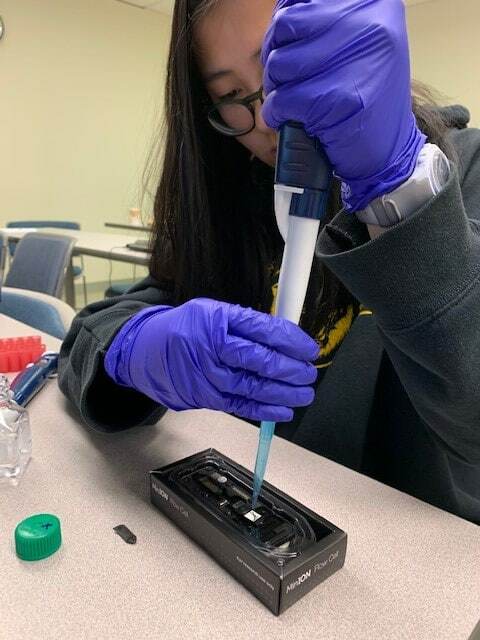 Nearly 40 students from across the state gathered at UAMS during spring break to attend a free genomics workshop March 18-20 where they learned about third-generation sequencing through lectures and hands-on computer work. Tristan Eoff of Little Rock, a high school student at Arkansas School for Mathematics, Sciences and the Arts in Hot Springs, was one of 38 enrolled in the March 18-20 workshop of lectures and hands-on computer work presented by UAMS and the University of Arkansas at Little Rock (UA Little Rock). David Ussery, Ph.D., director of the Arkansas Center for Genomic Epidemiology and Medicine at UAMS and professor in the UAMS College of Medicine Department of Biomedical Informatics, recruited other lecturers and helped develop much of the curriculum. Ussery also lectured during the workshop, now in its third year. Elizabeth Pierce, associate professor and chair of the Department of Information Science at UA Little Rock, initiated the workshop and organized it along with Ussery. “We’re giving the students experience with analyzing large volumes of data, known as big data, and getting them interested in the science and technology of it,” Ussery said. “We’re trying to deepen their interest in genomics.” Genomics is the study of all the genetic material of an organism. 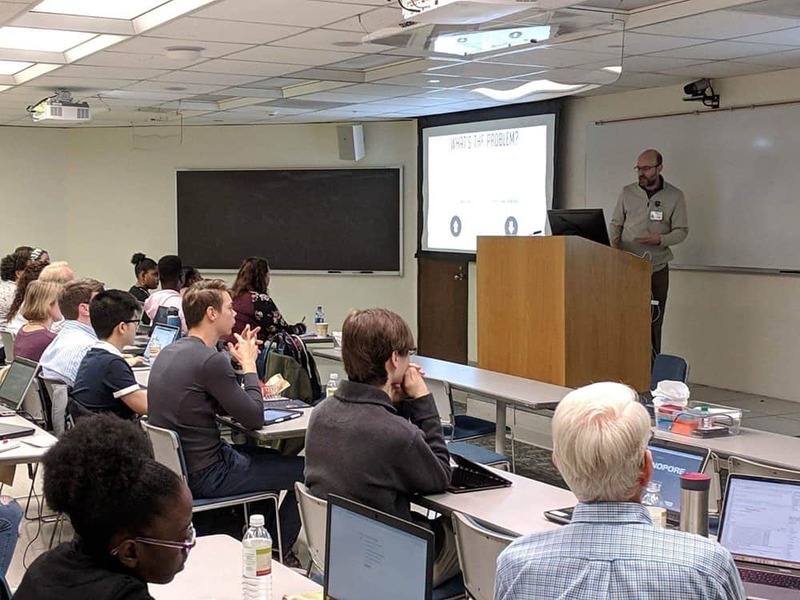 Ussery presented a lecture on biological information, including DNA, RNA, proteins and an introduction to bioinformatics, which uses computational methods to study biological information from DNA, RNA and proteins. Genome sequences can be used in clinical diagnostics as well as modeling complex biological systems. Joanne Huh, 15, and a 9th-grader at Central High, was one of the 38 attendees of a recent workshop where students learned about biological information, including DNA, RNA, and proteins. The students also practiced analyzing the date sequenced, comparing their sequences to known genomes in a huge DNA database. Students were divided into groups of about 10 and given a demonstration of flow cells — small, ‘disposable’ third-generation DNA sequencing machines. They were given unidentified DNA samples they loaded onto flow cells using devices plugged into laptops. Students practiced analyzing the data sequenced, comparing their sequences to known genomes in a huge DNA database. Their samples of unknown DNA from safe bacteria were grown in the lab but included some surprises. To keep the class on their toes, the organizers also threw in some unknown yeast and viruses. Six faculty members were also enrolled in the workshop, including Thompson’s biology professor, Rebekah Rampey, Ph.D.
Don Catanzaro, Ph.D., a research assistant professor in the Department of Biological Sciences at the University of Arkansas in Fayetteville, also attended the workshop. Catanzaro who, studies tuberculosis, says he works closely with genomics. The workshop was supported by the Arkansas IDeA Networks of Biomedical Research Excellence (INBRE). Arkansas INBRE is led by Lawrence Cornett, Ph.D., UAMS associate vice chancellor for research. Bioinformatics uses computational methods for the study of biological information that flows from the decoding and analysis of DNA, RNA and proteins. In the workshop, the students ran the sequencers for about 15 to 20 minutes, then stopped them to analyze the data. All four groups correctly identified their samples, just from a short time sequencing. “Back in 1995, it cost a million dollars and took 100 people more than a year to complete what we can now do in one afternoon with one high school student using a disposable sequencer,” Ussery said.